Anne Dallas Dudley (née Annie Willis Dallas; November 13, 1876 – September 13, 1955) was a prominent activist in the women's suffrage movement in the United States. After founding the Nashville Equal Suffrage League and serving as its president, she moved up through the ranks of the movement, serving as President of the Tennessee Equal Suffrage Association and then as Third Vice President of the National American Woman Suffrage Association, where she helped lead efforts to get the Nineteenth Amendment to the US Constitution ratified. She is especially noted for her successful efforts to get the Nineteenth Amendment ratified in her home state of Tennessee, the final state necessary to bring the amendment into force. 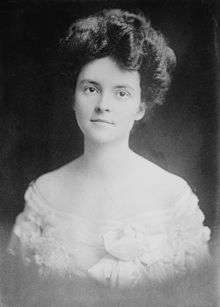 Anne Dallas Dudley was born Annie Willis Dallas in Nashville, Tennessee, in 1876 to a distinguished upper-class family. Her father, Trevanion B. Dallas, had moved to Nashville in 1869 and established himself as an entrepreneur in the textile industry. Her grandfather, Alexander J. Dallas, had been a commodore in the U.S. Navy, while his brother, George M. Dallas, served as Vice President of the United States under James K. Polk. Annie Dallas was educated at Ward's Seminary and Price's College for Young Ladies, both in Nashville. In 1902, she married Guilford Dudley (1854–1945), a banker and insurance broker. 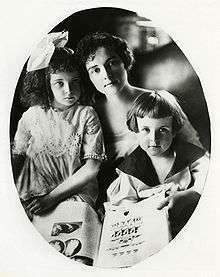 Together they had three children, Ida Dallas Dudley (1903–1904), who died in infancy, Trevania Dallas Dudley (1905–1924), and Guilford Dudley, Jr. (1907–2002). ↑ The initial members of the Nashville Equal Suffrage League included: Mrs. Guilford Dudley, Mrs. Blair Smith, Mrs. Willoughby Williams, Mrs. Ida Clyde Clarke, Mrs. C. T. Hixon, Mrs. E. T. Page, Miss Amelia Terrett, Miss Maria Thompson Daviess, Miss Mary Louise Baxter, Mrs. Yarbrough, and Mrs. T. G. Settle. 1 2 3 4 5 6 7 Goodstein, Anita Shafer (1992). "Anne Dallas Dudley, 1876–1955". Franklin County Historical Review. 23 (1): 61–65. 1 2 "Mrs. Dudley Sr. Dies at Home". The Tennessean. September 14, 1955. 1 2 Wills, W. Ridley (1993). 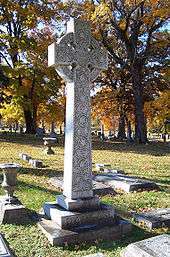 "Dallas Celtic cross". A Walking Tour of Mt. Olivet Cemetery. John W. Wagster. pp. 28–29. ↑ Taylor, Antoinette Elizabeth (1957). The Woman Suffrage Movement in Tennessee. Octagon Books. p. 33. ISBN 0-374-97850-6. 1 2 3 4 5 6 7 8 9 10 "Services For Mrs. Dudley To Be Held Thursday". Nashville Banner. September 14, 1955. 1 2 Anastatia Sims (1998). "Woman Suffrage Movement". In Carroll Van West. Tennessee Encyclopedia of History and Culture. Tennessee Historical Society. ISBN 1-55853-599-3. 1 2 Carole Stanford Bucy (1998). "Anne Dallas Dudley". In Carroll Van West. Tennessee Encyclopedia of History and Culture. Tennessee Historical Society. ISBN 1-55853-599-3. 1 2 Lindenmeyer, Kriste (2000). Ordinary Women, Extraordinary Lives: Women in American History. Rowman & Littlefield. pp. 200–209. ISBN 0-8420-2754-8. ↑ "Tennessee Woman's Suffrage Memorial". East Tennessee Foundation. Archived from the original on July 7, 2007. Retrieved 2009-01-05. ↑ Mason, Doug (March 26, 2006). "Marching into history - Memorial honors women who got voting rights cast in stone". Knoxville News-Sentinel. ↑ Tennessee Blue Book: 1995-1996 Bicentennial Edition (1796-1996). p. 397. ↑ "Remember the Ladies! : Women Struggle for an Equal Voice". Tennessee State Library and Archives. Archived from the original on 2016-10-15. Retrieved 2016-10-15. ↑ East, Jim (September 15, 1995). "Suffragist leader Dudley going into Women's Hall of Fame". The Tennessean. ↑ "Home". The Dallas. Retrieved 2015-07-29. ↑ "Nashville's Newest Monument Celebrates State's Role In Women's Winning The Right To Vote". Nashville Public Radio. Retrieved 2016-08-27.